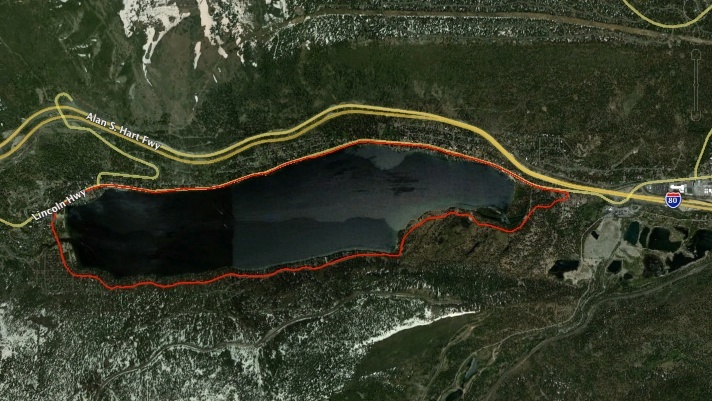 The 7-mile loop around Donner Lake is my go-to road run during the late Spring and Fall. It is scenic, fairly flat, and easily accessed from Donner Pass Rd. in Truckee. Click here for an interactive map and GPS data for the route. The loop is pleasant to run in either direction, starting at either end. The run is right at 7 miles if stay on the road through Donner Memorial State Park. You’ll shave off about .3 miles if you opt for the crushed granite trail through the park. Below I describe the run starting from West End Beach and traveling counter-clockwise. This is the normal route for the Donner Lake Turkey Trot. View from Donner Pass Rd. 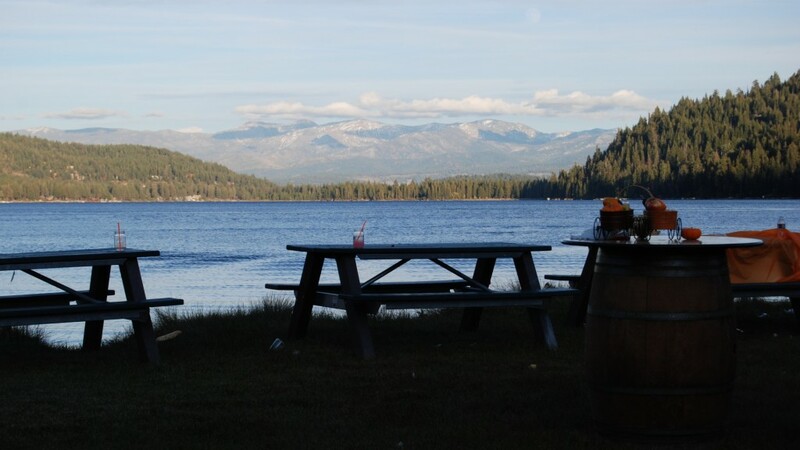 Get to West End Beach by traveling West on Donner Pass Rd. from Truckee. Turn left on South Shore Rd. at the end of the lake and before Donner Pass Rd. heads uphill to Donner Summit. Parking is free, but there is a fee to enter the park between Memorial Day and Labor Day. From West End Beach, head south then east on South Shore Rd. Gentle rolling hills take you generally uphill along the “backside” of Donner Lake. Traffic on the backside is very light in all but the peak Summer months. It is shady and cool back there, and prone to slick roads or black ice in the late Fall and Winter. After 2 miles, you drop down a short, steep section to the end of the road and a short paved path that enters the backside of Donner Memorial Park. Be advised that the path and road through Donner Memorial Park are NOT plowed in the winter. Follow the road through the park, hugging the lake / staying left until you reach the entrance kiosk, where you go left to Donner Pass Rd. Alternately, you can take the crushed granite trail (between the road and the lake) through the park, and follow the trail over the bridge then out to Donner Pass Rd. The trail gets crowded with slow-moving pedestrian traffic during the Summer months. There is considerably more traffic on Donner Pass Rd. than the backside of the lake, but the paved bike lane provides adequate space to run. Continue west along this flat to slightly-downhill road back to West End Beach. 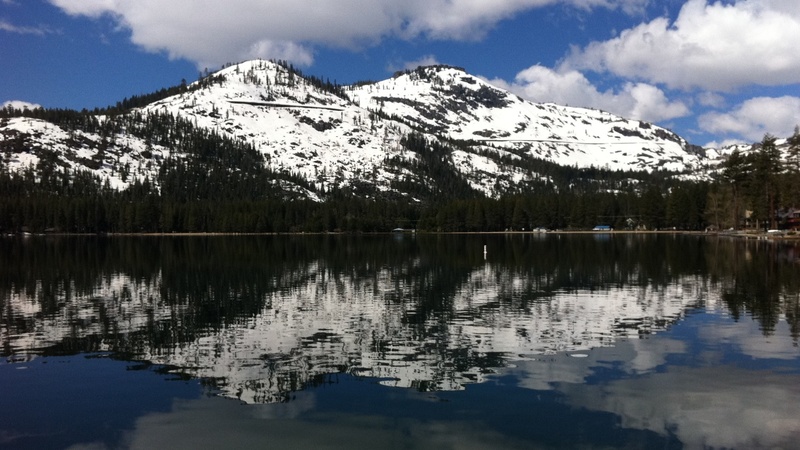 Reward yourself with a cold plunge in Donner Lake! There are several parking options around Donner Lake. The closest parking to Truckee is just outside Donner Memorial State Park, where you can park head-in on the dirt (assuming there is no snow) for free. On-street parking is also available around the lake from May through October – just be sure you don’t park in the bike lane. If you have member access to the Tahoe Donner Beach Club Marina, then park there and enjoy the run in either direction around the lake. Enjoy a cold plunge and snack before going about your day! Or, add mileage by exploring the crushed granite and dirt trails that wander through Donner Memorial State Park. Donner Lake Boat Ramp, located at 15511 Donner Pass Rd. Restrooms are closed for the winter. Shoreline Park, located midway on the North Shore / Donner Pass Rd. Restrooms are closed for the winter. West End Beach – located inside the park, so there is a fee to enter unless you are outside operating hours. Restrooms are normally open when there is no danger of freezing. Enjoy your run, and feel free to leave a reply below if you have questions or corrections! Thanks for the note! How lucky that you got to live at West End! I’ll be at Donner Lake next week, is this route marked? Is it South Short Drive to Donner Ct to Donner Pass Rd? Or is there a separate trail along the lake? I am so happy to find your blog as we are spending a few weeks up in Tahoe/Truckee in July and was looking for cycling and running recommendations. Look forward to trying out some of these routes. Please look me up if you are in AZ and need hooked up with some ultrarunners! Happy Trails! Happy to have landed on your website. I am visiting Tahoe region and your suggestions have been helpful as I was looking for a place to run my Sunday long distance running session. Loved the Donner lake loop! No much traffic at the end of August. Info for runners: “fairly flat” means “a few hills” on South shore road which make it a little more challenging if you have a pace to keep but definitely a great place to have quality training. Thanks so much for the kind words… it encourages me to finally get back to working on some of these routes. Hope you enjoyed your time in our little slice of paradise! Thanks for the route rec! This was great. Would you say this route is “stroller” friendly?